Warner Bros. Home Entertainment has released a new clip and two new photos for Scooby-Doo & Batman: The Brave and The Bold, which fans can pick up on DVD and Digital HD starting today. The ultimate crime-solving combination reunites when Batman joins the Mystery Inc. gang to catch a gaggle of villains wreaking havoc, one of whom is Edward Nygma, a.k.a. The Riddler. This clip features Batman (Diedrich Bader) revealing that he had no idea The Riddler was involved with Professor Milo, as Velma (Kate Micucci) stats they have to question him. Batman, on the other hand, thinks they need to sit this one out. Fred (Fred Welker) protests Batman's assessment, stating they've "explored tons of spooky places," but Batman states that they've never been any place like this, which turns out to be Arkham Asylum. While Velma is excited for the chance to explore new levels of the "criminal psyche," the scared Shaggy (Matthew Lillard) thinks Batman was right, that they should have stayed behind. The clip doesn't offer a glimpse at The Riddler himself, who is voiced by John Michael Higgins, but he's just one of several iconic villains that will be featured in this movie. Super sleuths Scooby-Doo, Shaggy, Fred, Daphne and Velma join forces with the world's greatest detective, Batman, when they discover that villains from both of their respective rogues' galleries have also combined efforts to terrorize the city. With Scooby snacks in tow, the crime-fighting teams encounter classic Batman foes (Joker, Catwoman, Riddler, Penguin, Scarecrow, Poison Ivy, Gentleman Ghost, Harley Quinn) and allies (The Question, Aquaman, Plastic Man, Martian Manhunter) along with a bevy of fiends from Scooby-Doo lore (Spooky Space Kook, Miner 49er, Ghost Clown). As always, you won't know who the ultimate villain is until those "meddling kids" pull off the mask! 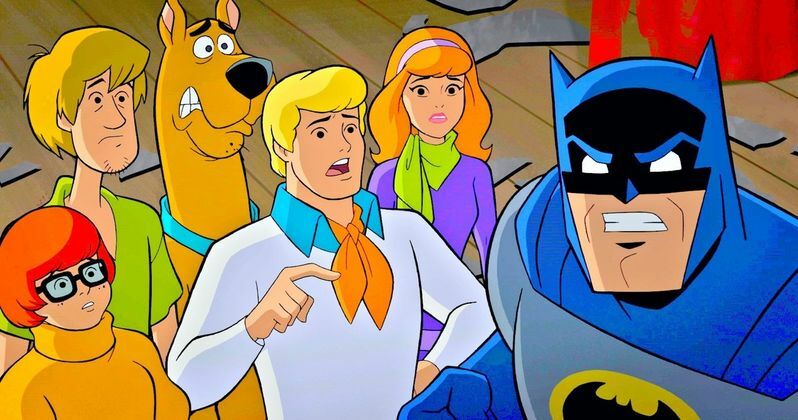 Avid Scooby-Doo fans know this isn't the first time the Caped Crusader has partnered with Mystery Incorporated. Forty-five years ago, Batman (and Robin) were the featured guest stars in a pair of The New Scooby-Doo Movies. Premiering in 1972, the renowned detectives worked to solve crimes together in the hour-long television movies entitled The Dynamic Scooby-Doo Affair and The Caped Crusader Caper. Diedrich Bader, who voiced the Dark Knight in the fan-favorite Batman: The Brave and the Bold animated television series, reprises his role for this all-new film alongside the longtime Scooby-Doo voice cast of Frank Welker (Scooby-Doo & Fred), Grey Griffin (Daphne and Black Canary), Matthew Lillard (Shaggy) and Kate Micucci (Velma). The guest cast includes Jeff Bennett (Joker), Jeffrey Combs (The Question), John DiMaggio (Aquaman), Nika Futterman (Catwoman), Nicholas Guest (Martian Manhunter), John Michael Higgins (The Riddler), Tom Kenny (Penguin, Plastic Man), Kevin Michael Richardson (Detective Chimp), Tara Strong (Harley Quinn, Poison Ivy) and Fred Tatasciore (Harvey Bullock). Jake Castorena directs the teleplay by Paul Giacoppo, based on a story by supervising producer James Tucker. Michael Jelenic is the producer. Executive Producer is Sam Register. Benjamin Melniker and Michael Uslan are Executive Producers. Take a look at this new clip and photos from Scooby-Doo & Batman: The Brave and The Bold, courtesy of Warner Bros. Home Entertainment YouTube. New Scooby-Doo Design Revealed in Upcoming Scoob Movie?